There are two equally compelling myths surrounding the names of this ancient tower on a tiny islet just offshore of Uskudar. In Turkish it is known as the “Maiden’s Tower”, after a legendary princess who was confined here by her father after a prophesy foretold that she would die of a snakebite. Not surprisingly, she did not outdo fate, and was bitten by a snake lying hidden in a basket of fruit. The other myth is that of Leander, a Greek who was said to have swum the Hellespont (actually located a bit further south, today the Dardanelles) each night to visit his lover Hero. 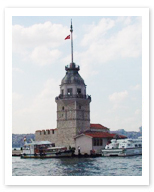 In more recent years this storied, unmistakable monument has served as a quarantine tower, a lighthouse, a customs point, a toll center, and a movie set for the James Bond film “Tomorrow Never Dies.” Today, reservations are necessary for the café/restaurant which now occupies this little island sitting in the middle of the Bosphorus.